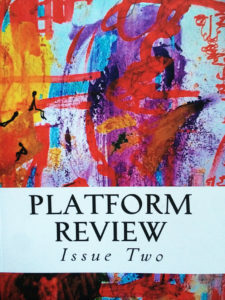 Platform Review is an ARTS By The People project. Along with our literary open mic reading series, The Platform; our writing workshops; and Chapbook Awards, we promote opportunities and establish a platform for writers and artists. The mission of Platform Review is to showcase the literary voices and visual art from our growing community. We publish annually in print. We do not accept previously published writing. Submit up to 5 poems in one document, one poem per page. Submit one story up to 3,000 words. If your piece is chosen, we hold first North American serial rights to publish and print your piece in our annual review. When the piece is published, the rights revert back to author. ﻿Submissions are open until December 1st, 2017.